CDC is dedicated for the development of Children's, we are working for the development of children's in different ways. 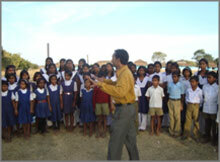 Through our various projects, we work on child issue. We train school going children's on child rights, presently we are working with two private schools and 5 Govt. 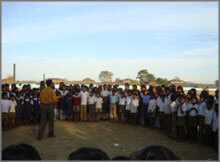 schools, quarterly we conduct sessions at schools on their rights discuss on various issue i.e. health, personnel hygiene etc. CDC has taken up one Anganwadi Centre of KHAJRA village, and we start working with community and other stakeholder to bring the Anganwadi centre among community to manage malnutrition, child growth and ensure availability of quality services of Nutrition and Health. CDC is active to work other child related issues, i.e. Child Labor, Child Trafficking, Displacement, at the district level we raise this issue with other local NGOs and doing some advocacy. •	CDC is going to start work with CHILDLINE FOUNDATION. CDC is organizing different campaigns i.e. NREGA, RTI, WADA NA TODA, GYSD etc. with the support of National and International organization. We are working continue on effective implementation of National Rural Employment Garantee Act. [NREGA] in our project areas, CDC promots rural community for demand of employment, timely wages and strengthening Panchayat Institutions for making of development plan for their own village/Panchayats. CDC promotes people to access informations to solve their problems and insure people rights. CDC working in this campaign with the support of SAMARTHAN Bhopal sincel year 2005-06.